Edited by Sharma S. Prabhakar . The study of the fundamental and clinical aspects of glomerular disease has expanded exponentially over the last several decades. Fresh insights into old clinico-pathological entities emerge frequently and continuously. New disease entities also arise as the sophistication of investigation expands. Novel disease-specific treatments are applied often with impressive results while older, more empiric therapeutic strategies are in a constant state of evaluation and re-evaluation. Thus a book dealing with recent advances in the field of glomerulopathies from both clinical and therapeutic aspects is a welcome addition to our knowledge base. 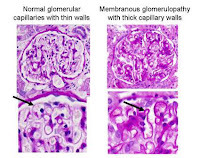 An Update on Glomerulopathies - Clinical and Treatment Aspects builds on the background provided by An Update on Glomerulopathies - Etiology and Pathogenesis. In 24 concise, focused and well-formulated chapters the broad scope of clinical and therapeutic aspects of primary and secondary glomerular disease is reviewed and updated. The Editor, Dr. Sharma Prabhakar has chosen both the topics and the authors wisely. The contributions will have great appeal and value to the practicing clinician who frequently must face diagnostic and management challenges in this arena of medicine. While not exhaustive in coverage, the topics included embrace an impressive breadth of clinical experience in these disorders. The contributions also examine contemporary issues in sufficient detail to serve as an excellent guide for the clinician as well as trainees in nephrology. An Update on Glomerulopathies - Clinical and Treatment Aspects illustrates how far we have come in our understanding of clinical issues in glomerular disease, but also shows how much more needs to be understood.